Drinks at a friend's place. Dassai Sparkling 50 (獺祭 スパークリング50) - interesting that in addition to a sparkling wine, this was also an unfiltered sake (にごり酒). Nose of banana, fermented rice and yeasty notes. Pretty sweet on the palate as expected. Dinner at Sotheby's, co-hosted by Domaine Clarence Dillon with Prince Robert of Luxembourg. 2011 Clarendelle Blanc - very ripe, very aromatic, with lots of oak, vanilla and citrus. 2009 La Clarté de Haut-Brion - a very big nose with toasty notes, sweet, buttery corn and lemon. Rich and fat, very ripe and hot on the palate. Pretty enjoyable, actually. 2009 La Mission Haut-Brion Blanc - opened for 3 hours prior to serving. A very big wine but much more elegant compared to the first two wines. Seemingly thinner at first, with a fragrant nose showing citrus notes, nice and buttery, toasty, almost a little pipi de chat from the Sauvignon Blanc, a little sweet around the edges. A beautiful and complex wine. 2009 Haut-Brion Blanc - opened for 3 hours prior to serving. Much more showy than its sibling, displaying citrus, more pipi de chat thanks to a greater proportion of Sauvignon Blanc in the blend, petrol and muscat grape. Very ripe on the palate but with good acidity balance. 2009 La Chapelle de la Mission Haut-Brion - double-decanted for 6 hours prior to serving. Really sweet, almost a little jammy, with a hint of smoke. A very delicious wine that is somewhat ready to drink, but obviously this was a little young… I would love to revisit this wine in another 10 or 20 years. 2000 La Mission Haut-Brion - double-decanted for about 3½ hours prior to serving. Ripe on the nose and a classic claret on the palate. A little mineral, savory like black olives, with animal and grilled meat notes. Delicious. 1990 La Mission Haut-Brion en magnum - double-decanted for about 3½ hours prior to serving. Definitely prominent notes of brett, very savory with lots of black olive tapenade, earthy, mineral, cigar notes, but still have some of that sweet fruit core underneath it all. Clarendelle Amberwine - not exactly a complex sweet wine, but nevertheless showed classic marmalade, pineapple and botrytis. 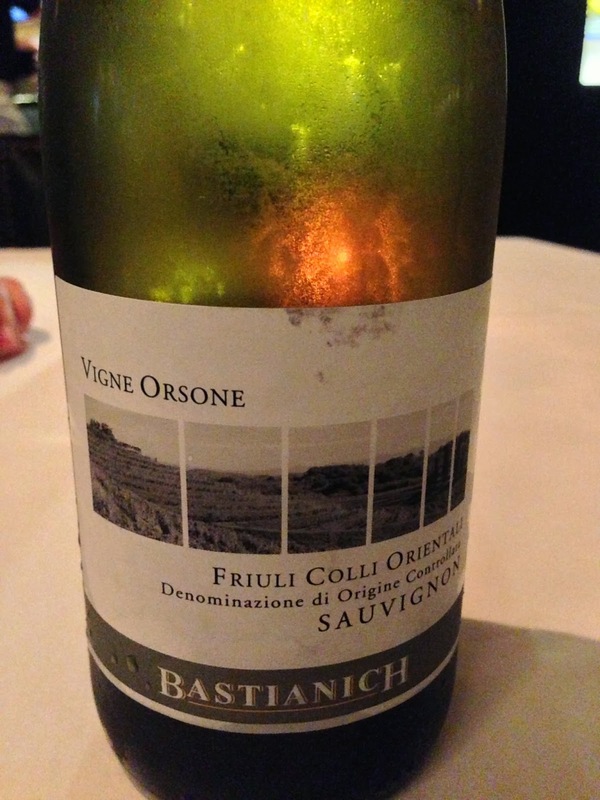 Bastianich Friuli Colli Orientali Sauvignon Vigne Orsone (vintage unknown) - very fragrant, floral, tropical fruits like peaches, apricot. Drinks at the Members' Bar, Hong Kong Club. 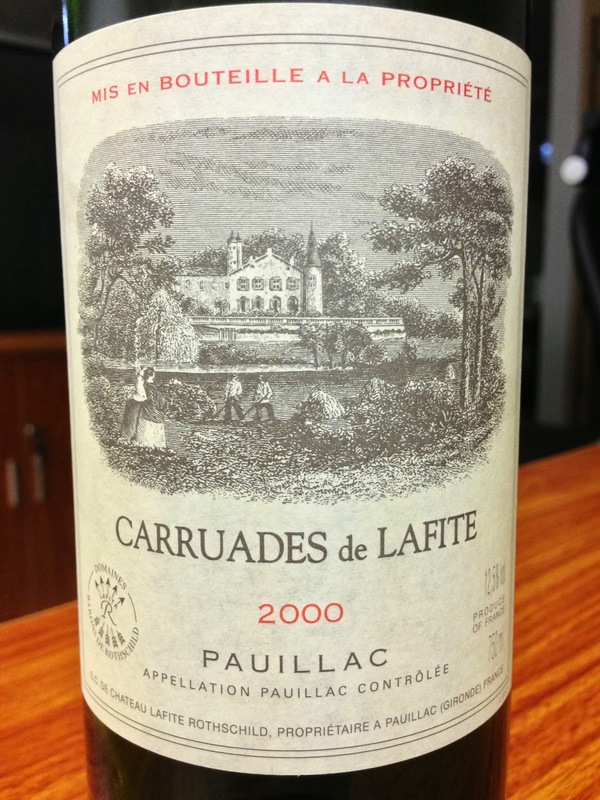 2000 Carruades de Lafite - a classic claret, with lots of dried herbs, cedar and grilled meats underneath a cloak of sweet fruits. A very delicious and enjoyable wine. Notes consistent across 2 bottles. 1997 Vincent Girardin Corton Charlemagne - this was completely oxidized and showed a deep, golden hue. The nose showed caramel, Chinese licorice and mineral notes. Very ripe on the palate, and also a little tart. Not really enjoyable. Dinner at Shunsai in Taipei. 1998 Dom Pérignon - toasty and smoky, with ripe orange and marmalade notes. Very nice. 2001 Ramonet Bâtard-Montrachet en magnum - very toasty, very ripe and lovely nose. Finish was a little short, so somewhat disappointing. 2002 Colgin Herb Lamb Vineyard - Wow! This was definitely a Cali! Very sweet and really ripe nose, with lots of sweet fruit. Dried herbs, caramel and toffee. Love this wine. 1995 Rihaku Daiginjo Choki Jukuseishu 1995 (李白大吟醸 長期熟成酒1995, bottled October 1998) - I had expected a koshu (古酒) to display a nose similar to those from Chinese yellow wine like Shaoxing (紹興酒), but this wasn't like that at all. Having been matured at low temperature, this was very rounded, smooth and elegant. Pretty sweet on the palate. 40% seimaibuai (精米歩合). Kikuisami Sanjurokuninshu Junmai Daiginjo (菊勇 三十六人衆 純米大吟醸) - this was recommended by the chef when we needed more alcohol. Not bad, but I liked the Rihaku better. 40% seimaibuai. Dinner at I M Teppanyaki. 2003 Dom Pérignon - toasty nose. Very ripe on palate, to the point it was a little bitter. Ripe citrus. 1997 Vincent Girardin Corton-Charlemagne - golden hue… looking a little oxidized. A little oaky in the nose, and a little bitter on the palate with marmalade. Short finish. Kinda disappointing. 1998 Mondavi Sauvignon Blanc Botrytis from half-bottle - nose of acetone, botrytis, orange blossom and honey. Nice pairing with the foie gras, as the acidity of the wine cuts the fat. 2000 Joseph Phelps Insignia from magnum - a little smoky with some soy sauce and savory nose. A good amount of sweet fruit. Altaya Wines' party at Azure Restaurant "slash" Bar to celebrate their exclusive distribution deal with Gaja. Gaia Gaja came to Hong Kong for this. Unfortunately there was no Gaia and Rey around for us to taste. It would have been nice to taste Gaja Gaia with Gaia Gaja! 2011 Gaja Rossj-Bass - a little oaky, mineral, really sweet with fruits like peach, vanilla, marshmallow. Very ripe on the palate, and burns a little thanks to the alcohol. First tasting through the Tuscan estate of Ca'Marcanda. 2011 Ca'Marcanda Promis - first glass was a little dusty, there was fruit but in general tasted moldy - possibly corked or a bad glass. Second glass was better without the mold, and showed black cherries. 2005 Ca'Marcanda Magari from magnum - very fragrant and open. A little sweet, dried herbs, cedar and a hint of smoke. Tannins are still there and a little chewy. Paulo told me to skip all the Langhe/Barbarescos (as if!) and just go straight for this bottle, and his recommendation was right on the mark. 2004 Ca'Marcanda Camarcanda - a little sweet on the nose, fragrant, ripe, still alcoholic with a hint of leather. Not bad at all. Moving on to another Tuscan estate, Pieve Santa Restituta, in Montalcino this time. 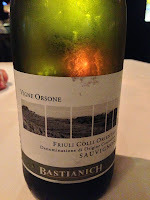 2008 Pieve Santa Restituta - more stewed prunes and leather here. 2007 Pieve Santa Restituta Rennina - woody, dried herbs, potpourri and black fruits. 2007 Pieve Santa Restituta Sugarille - a little more smoky and earthy, black fruits, pretty sweet and caramel. 2006 Gaja Sorì San Lorenzo - fragrant nose with dried herbs, a little grilled meats and leather, pretty sweet. A lovely wine, but still kinda tannic given its young age. 2006 Gaja Sorì Tildìn - more leather and smoke. Less sweet than Sori San Lorenzo, but a little caramelized on the edges. 2008 Gaja Barbaresco - new bottle and very tight. Mid-palate softer than expected but with a tannic finish. Good fruit here and very pleasant, with potpourri and herbs. Congratulations to Altaya Wines for the coup! Wine tasting at Sotheby's. My understanding is that all wines were opened for 3 hours prior to the start of tasting at 6pm. 2009 La Lagune - whew! Not drinkable in my opinion... so alcoholic and sharp it felt like paint thinner. OK so underneath the alcohol, there was actually some sweetness and exotic coconut butter. 2005 La Lagune - very fragrant, with cedar, dried herbs and sweet fruit. What a lovely wine! 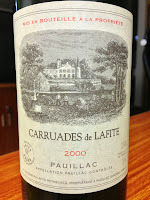 2004 La Lagune - forest, dried herbs, fruity and a little jammy. 2003 La Lagune - very fragrant, cedar, meaty and a little smoky. 2001 La Lagune - more farmy, meaty, smoky, a little medicinal. Very classic. 1998 La Lagune - a little sweet and fragrant. Not bad at all. 1990 La Lagune - very smoky, cigar box, meaty. At its peak and not gonna get any better from here. 2001 Jaboulet La Chapelle - very ready to drink and lovely. Round tannins. 2007 Jaboulet La Chapelle - very ripe on the nose, sweet, a little alcoholic, some pine needle notes. 2000 Beaucastel Rouge - a much bigger wine than I expected. Very sweet and ripe. 2005 Clos des Papes - sweet and very ripe, jammy, with Chinese licorice, cane sugar and blueberries. Very nice. It's clear to find stylistic differences between the wines made before Caroline Frey took over as winemaker in 2004, as the wines are bigger and riper nowadays. I thought the 1990 drank well for a mature wine, and liked the 2003 and 2005.